TV5 is setting another historical move in Philippine TV as the Kapatid Network will soon launch an international star into a primetime prince. 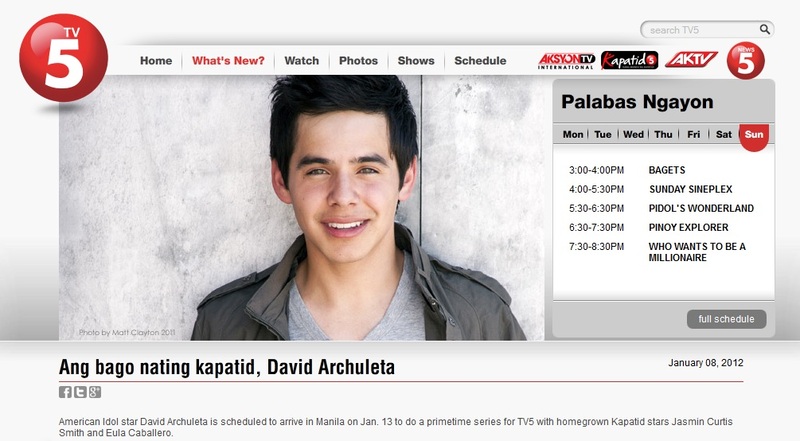 David Archuleta, one of the most followed American Idol star in the country, is set to do a primetime series for TV5. He will be paired with homegrown talents Jasmin Curtis Smith and Eula Caballero. This move is probably the second attempt of a Philippine Network to cast an international star in a TV series. Back in 2004, GMA Network tapped Argentinian actor Segundo Cernadas to play Iza Calzado's lead in the Kapuso teleserye Te Amo, Maging Sino Ka Man.